The Integra GS-R is going to be used for some track lapping this year. I wasn't able to get it going last year due to some unexpected suspension issues. Turns out that the suspension delays were a good thing as I ended up doing a big brake upgrade with the suspension upgrades as I had more time to work on them. So the car will run better than ever. I will also have a WRX that could be used as well, but I think the Integra will be more fun. My son will be lapping with me, so I want a casual lapping day event. A track that is not too busy and not over-run with serious track cars/racers. I don't want to slow anyone up or worry about over finicky track etiquette. I've got some track capable brake pads but I will be running street tires. I'm closer to Grand Bend Raceway, and Cayuga is a bit farther, both doable if the event fits. Weekends work better for me, weeknight lapping doesn't work with my lifestyle. I may have a test pipe early in the season until I can get a custom high flow cat built, so I don't want to be in an area where police may be out looking for street racers outside of the track like I've heard happening at some track events. I've got some older helmets from my track days when I used to organize events at Gingerman Raceway, but that was 15+ years ago. Outside of them being a bit dusty the helmets are out of date, so I'm not looking for a place that is strict about helmet ratings etc. If anyone is organizing or attending some casual lapping days this year please post up where and when, thanks kindly for reading. The Monday or Friday open lapping at Cayuga if you're ready to go when the track opens at 10am, I've had pretty good luck with the couple of times I've gone. The last time it was me and a GT3 until about 11:30 when maybe 4 or 5 other cars showed up. A couple of them were idiots so I only stayed another hour or so more but I had my fill for the day. pic stamp says June 16, 2017 @ 10:26am. 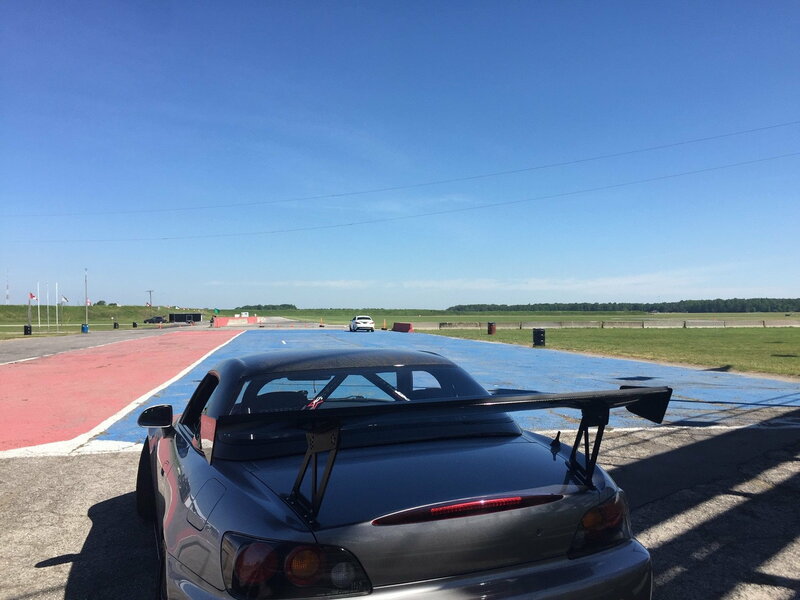 Track was empty and it was obviously a gorgeous day. Thanks for the replies, I didn't realize they have weekday day events. That would be nice as I could excuse myself from the meaningless work that I do each day, lol. Yup. I think Monday's and Friday's are generally open lapping days unless someone rents out the track. They usually have a schedule posted online. I think it was like $160 from 10-5 or something like that. I'll likely bring my Si to Grand Bend on occasion. I'll let you know. We could have some fun. Thanks Norm, I had no idea they did daytime weekdays, that could work nicely during the summer months, I will have a look at the schedule. Sure thing, GB is closer for me, it would be nice to meet up there Robin, all the best. Keep in touch. lll likely be at grand bend more this season. Hit me up if you’re going. I’ll bring the camo! Sounds good Nick, I'd love to see the camo up close and behind the tail lights lol. GB sounds like a better setup for what I'm looking for if my son will be joining me, willing to try TMP if it isn't too crowded on a weekday. I'll be in touch if the warm weather ever arrives. Quick Reply: Casual Lapping Track Events in 2019 ?